The outskirts of galaxies hold fundamental clues about their formation history. It is into these regions that new material continues to arrive as part of their ongoing assembly, and it was also into these regions that material was deposited during the violent interactions in the galaxy's distant past. Moreover, the long dynamical timescales for structures beyond the disk ensure that the debris of accreted material takes a very long time to be erased by the process of phase mixing, which in turn means that it is possible to detect many of these signatures of formation as coherent spatial structures. Much theoretical effort has been devoted in recent years to understanding the fine-scale structure of galaxies, as researchers realized that cosmological models could be tested not only with the classical large-scale probes, such as galaxy clusters, filaments, and voids, but also with observations on galactic and subgalactic scales. Indeed, it is precisely in the latter regions that the best constraints on cosmology are expected to be put in the coming decades. 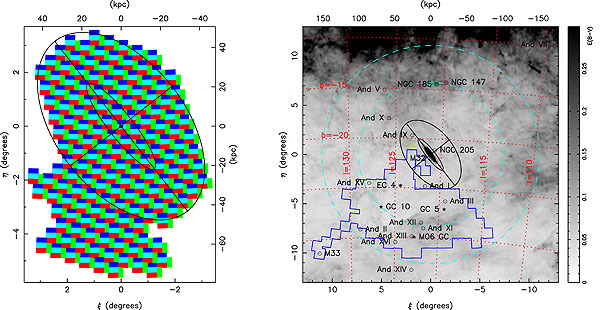 The ΓCDM cosmologies, in particular, are now sufficiently well developed theoretically that the Local Group provides a means of directly testing and constraining these theories, by observing the profiles of density, age, and metallicity of the structure and substructure predicted to be found in the outer parts of galaxy disks and in galaxy halos. Andromeda, like the Milky Way, is a canonical galaxy and a laboratory for examining in close detail many of the astrophysical processes that are investigated in the more distant field. Studying Andromeda and Triangulum in the Local Group has the advantage that it affords us a view free from the problems that plague Galactic studies due to our position within the Milky Way, yet their location within the Local Group allows us to resolve and study individual stars and deduce population properties in incomparably greater detail than is possible in distant systems. Andromeda is the closest giant spiral galaxy to our own and the only other giant galaxy in the Local Group. In many ways Andromeda is the “sister” to the Milky Way, having very similar total masses, having shared a common origin, and probably sharing the same ultimate fate when they finally merge in the distant future. However, there are significant differences between these “twins” M31 is slightly more luminous than the Milky Way, and it has a higher rotation speed and a bulge with higher velocity dispersion. M31 possesses a globular cluster system with ~500 members, approximately 3 times more numerous than that of the Milky Way. The disk of Andromeda is also much more extensive, but is currently forming stars at a lower rate than the Galaxy. There are indications that the Milky Way has undergone an exceptionally low amount of merging and has unusually low specific angular momentum, whereas M31 appears to be a much more normal galaxy in these respects. Although possibly the consequence of low number statistics, it is tempting to attribute significance to the fact that Andromeda has a compact elliptical (M32) and three dwarf elliptical galaxies (NGC 205, NGC 147, NGC 185) among its entourage of satellites, as well as no star-forming dwarf irregulars (dIrrs) within 200 kpc, whereas the Milky Way has no ellipticals but two dIrrs. However, it is perhaps in their purported halo populations that the differences between the two galaxies are most curious and most interesting. If Andromeda is the twin of the Milky Way, the Triangulum galaxy (M33), with a mass ~10 times lower than either of these two giants, is their little sister. M33 is the third brightest galaxy in the Local Group and probably a satellite of M31. The relatively undisturbed optical appearance of M33 places strong constraints on the past interaction of these two galaxies, although it should be noted that the gaseous component is extremely warped. In order to study in more detail the halos of both the Andromeda and Triangulum galaxies, astronomers performed a deep photometric survey of the Andromeda galaxy, conducted with the Wide Field Camera of the INT and MegaCam on CFHT, that covered the inner 50 kpc of the galaxy and the southern quadrant out to ~150 kpc and included an extension to M33 at >200 kpc. 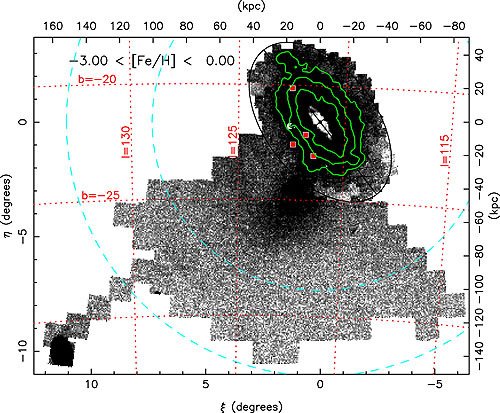 This is the first systematic panoramic study of this very outermost region of galaxies. They detected a multitude of large-scale structures of low surface brightness, including several streams, and two new relatively luminous dwarf galaxies: And XV and And XVI. Left: coverage of the large panoramic survey of M31 with the INT Wide Field Camera, in standard coordinates (ξ, η). The inner ellipse represents a disk of inclination 77° and radius 2° (27 kpc), the approximate end of the regular H I disk. The outer ellipse shows a 55 kpc radius ellipse and the major and minor axes are indicated with straight lines out to this ellipse. This map is constructed from a total of 164 INT WFC individual pointings. Right: survey region (irregular blue polygon) overlaid on a schematic diagram of M31 and surrounding Local Group structure. Note that the survey extension along the M31 minor axis reaches M33 and therefore probes the halos of both these disk galaxies. In addition to the ellipses reproduced on the left-hand figure, the two concentric dashed circles show projected radii of 100 and 150 kpc. A grid in Galactic longitude and latitude has been marked. The extinction over the surveyed region, is also shown. (Extracted from Ibata et al., 2007, ApJ, 671, 1591) [ JPG | TIFF ]. Significant variations in stellar populations due to intervening stream–like structures are detected in the inner halo. Underlying the many substructures lies a faint, smooth, and extremely extended halo component, reaching out to 150 kpc, whose stellar populations are predominantly metal-poor. They find that the smooth halo component in M31 has a radially decreasing profile that can be fitted with a Hernquist model of immense scale radius ~55 kpc, almost 4 times larger than theoretical predictions. If it is symmetric, the total luminosity of this structure is ~109 solar luminosities, again similar to the stellar halo of the Milky Way. This vast, smooth, underlying halo is reminiscent of a classical “monolithic” model and completely unexpected from modern galaxy formation models. M33 is also found to have an extended metal-poor halo component, which can be fitted with a Hernquist model also of scale radius ~55 kpc. These extended slowly decreasing halos will provide a challenge and strong constraints for further modeling. Matched filter map to the limiting depth of the INT survey (i0=22.8 for S/N~10). The contours show the approximate location of the surface brightness levels 27, 28 and 29 mag arcsec-2 respectively. (Extracted from Ibata et al., 2007, ApJ, 671, 1591) [ JPG | TIFF ]. R. Ibata, N. F. Martin, M. Irwin, S. Chapman, A. M. N. Ferguson, G. F. Lewis, A. W. McConnachie, 2007, "The Haunted Halos of Andromeda and Triangulum: A Panorama of Galaxy Formation in Action", ApJ, 671, 1591.